Winning at trial is largely about the juror’s gut reactions to you as an attorney and to your witnesses, as well as their gut reactions to the counterparts on the other side of the courtroom. Trial testimony and videoed deposition testimony are the lenses through which jurors (and the court) will get to know those individuals that know the most about your case. These situations are often the make or break moments during a litigation that either ensures your victory or defeat. So, you absolutely must prepare your witnesses for these situations by educating them on the process, what to expect, how to behave, and the goals of your client. When I prepare a witness for deposition I explain the things above and give them a routine for answering questions that they MUST adhere to on every question. That routine is: (1) listen carefully to the question asked; (2) identify whether you understand it; (3) formulate the complete answer to that specific question in your head; and (4) take a breath and then say the answer you just formulated. This accomplishes several things. It forces your witness to take his or her time. It forces the witness to think about each question. And, it creates a pattern for the deposition. All this will help your witness get through the process and should help you not suffer overwhelming damage during the deposition - you can't win a deposition, but you can definitely lose one. To say that this fellow will be an unsympathetic witness at trial seems to be a severe understatement. After watching the video above, I’d put him right up there with O.J. Simpson and Alec Baldwin’s character in Malice as a bad witness. He oozes arrogance, he’s belligerent with the deposing attorney, he’s not wearing a suit, his posture is terrible, his hair is ridiculous, he’s rude, he’s evasive, he’s a smart-aleck, and he is overstepping his witness role and actually objected to a question. If the jurors at this trial aren’t 12 year old girls, he’s going to lose. Worst of all, now that this is public, anyone with a lukewarm legal gripe against this “kid” (he’s 20 years old) will be chomping at the bit to sue him. Justin Beiber is either unteachable or was not properly prepared for this deposition (he might be unteachable). How would I have handled the witness preparation? First, he should have been educated about what a deposition really is – it’s a surrogate for the courtroom and what you do and say during a deposition should portray you as you’d want the court or jury to know you. I doubt Mr. Beiber understood what testifying under oath means, what perjury is, that the video of the deposition could be played in court as testimony or for impeachment purposes. He showed no understanding and less respect for the process and judicial system. Mr. Beiber was not prepared to keep his cool – he was totally flustered by the mere mention of his on-again-off-again girlfriend Selena Gomez. I’d guess he wasn’t ready for the types of questions he was asked in the clip you saw above, but he should have been. It’s our duty as counsel to give our witnesses whatever mental/psychological tools they need to do a great job. Mr. Beiber should have been forced to practice tough deposition questions, should have been educated how to answer questions strategically, and should have been prepared so he didn’t look like a fool. Effective witness preparation should have been conducted. Like I said, though, maybe it’s him. Was Mr. Gates much better than Mr. Beiber? He may sound smarter, but still looked like a jerk (and will, forever, on video). What Mr. Gates didn’t understand, but should have been educated on prior to being deposed, is that YOU CANNOT WIN A DEPOSITION. You can’t. You can only survive one and mitigate your damage. To prepare a witness to do just that, survive and mitigate, they must know the eight rules I set out above. Moreover, they must have a strategy for answering deposition questions that serves to end the deposition more quickly rather than draw it out. What do I mean by this? Well, while Bill thought he was being smart and challenging the deposing attorney on question after question and pointing out ad nauseam why he thought the attorney was doing a bad job deposing him what was he accomplishing? Nothing, but extending his time in the witness chair. Let’s see another testimony and decorum failure to the tune of $10,000 and jail time. OK, so technically this is not a deposition, but it’s entertaining and emphasizes a point. You must treat a videotaped deposition like a court appearance and if you screw around during a court appearance you’re going to have a bad day. Here’s another guy that’s not prepared for his deposition. This is Dwayne Michael Carter, Jr., better known to consumers of hip hop music as “Li’l Wayne.” Here’s a guy that needs to be convinced to take this exercise seriously. He shows absolutely no respect for the deposing attorney or the process, and, hence, for the court. Does Li’l Wayne seem truthful? Does he seem credible? Does he seem like someone you’d, as a potential juror, want to help or see fail? Li’l Wayne might be a tough witness to help prepare because he doesn’t fear much: not the lawyers, not the press, not even jail time (the jail time he received may have even helped his street “cred” and career). So, what do you do to help him get through this experience? Perhaps it’s his time that he values, so appeal to his desire to have the deposition be as short as possible and teach him how to listen to and answer only the questions asked, clearly, straight forwardly, and briefly. 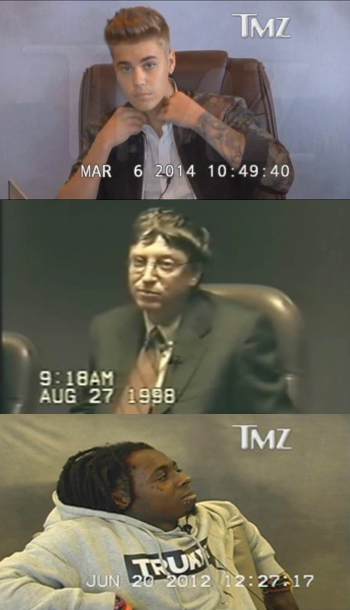 Finally, here’s an all-time favorite deposition video (Rated R). Had he been prepared for this video, this “gentleman” would have known this subject would come up and could have been ready to keep his emotions under control. The middle of this tirade would have been a good time for his counsel to reach over and put his hand on him and say, “calm down and just answer the question asked.” Even though representing counsel is not supposed to intervene during questioning, the deposing counsel would have probably preferred not to be sworn at by the witness. Sometimes, when the deposition or court witness to be prepared is familiar to the attorney preparing him, such as a client or expert witness, it can be difficult for the attorney to fully prepare the witness alone. It’s often hard for an attorney in such a relationship to give the “tough love” needed. Sometimes, having had to fully imbibe the Kool-Aid for the case, the shortcomings of the witness may be glossed over by counsel. This is where engaging a 3rd party witness preparation consultant can help. Much of what I know about witness preparation I learned from the great Dave Malone. He was a terrific guy and a terrific help when I prepared my own witnesses for deposition and then trial testimony. Dave was taken too soon and too young and I’ll always remember him fondly. The Jodi Arias Trial, A Case Study in Experts, Witness …or Witless?